No bidder came forward to take over Pelamis as a going concern so its 16 remaining staff will shortly be made redundant. The remaining staff at defunct wave power company Pelamis will be made redundant, administrators have announced. 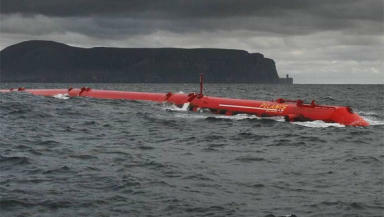 Highland and Islands Enterprise, the Scottish Government's economic development agency for the north, has been announced as the preferred bidder for acquiring Pelamis Wave Power Limited's assets after it entered administration on November 21. No bidder came forward to take over Pelamis as a going concern so its 16 remaining staff will shortly be made redundant, administrators said. A substantial number of Pelamis employees were made redundant following the joint administrators' appointment. The Scottish Government set up a public innovation company Wave Energy Scotland following Pelamis' demise and pledged to offer job opportunities for some of its staff. "We would like to thank all parties who expressed an interest during the sale process. "The HIE team delivering Wave Energy Scotland is now engaging with KPMG to complete the purchase. "Scotland is determined to remain at the forefront of wave power innovation. We are delighted that these valuable intellectual assets will remain in Scotland and form the foundation of Wave Energy Scotland's programme." "Marine renewables have the potential to play an important role in our future energy mix, helping to cut climate emissions and create jobs around our coastline. Successfully harnessing the power of the waves is a challenge we must rise to if we're to end our addiction to polluting fossil fuels. "With 10% of Europe's wave power potential and some of the technology's leading innovators and companies, Scotland is ideally placed to deliver wave power commercially in the coming years."